Following up on a comment (an as I sit here in my high medieval tower hearing the winds howl through the stone) I want to discuss the institution of Patron Saints. 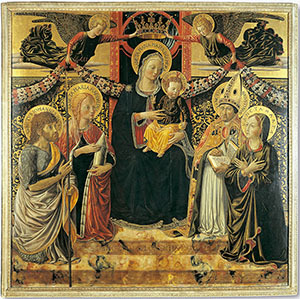 To me, the key to how Patron Saints were understood in the Middle Ages and Renaissance is the concept of the Heavenly Court. Heaven was often imagined (especially by the less educated classes) as a direct parallel to feudal Earth, that is as a court, with God in the role of ruler, i.e. Emperor, King, Duke, whatever sort of Signore (lord) people are used to. Heaven in this model is the capital city, and the saints are the courtiers who enjoy the favor of the Lord and are invited to His court. 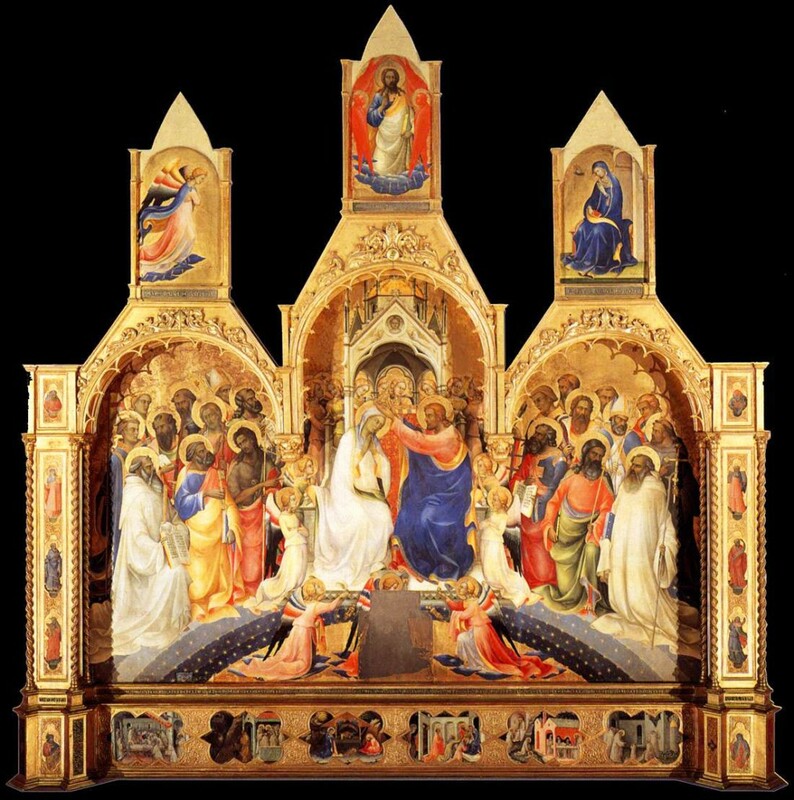 Mary is the Queen of Heaven, and literally the Lady presiding over the heavenly court. In normal feudal life when someone needs a favor from a lord, i.e. a tax break, help repairing a bridge, an office, permission to marry in odd circumstances, the settlement of a dispute, one doesn’t go directly from peasant life to the king, one goes through intermediaries, petitioning a local lord, who petitions a higher-ranking noble, who then sends the petition on to the sovereign, or, if nervous that the sovereign might be harsh, to the Lady of the court, who is supposed to be more likely to be sympathetic. 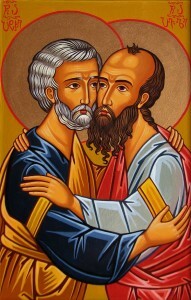 The most powerful saints, Peter, Paul, John the Baptist, are the inner circle of favored councilors, and newcomers like St. Francis of Assisi sometimes join the ranks of inmost courtiers. The courtiers of Heaven assemble to watch the coronation of the Queen. You should be able to spot Peter, Paul, John the Baptist and Lorenzo among their ranks. Beatrice presents the newcomer Dante to some of the heavenly court. Thus, in Dante’s Commedia, when Beatrice (a virtuous, deceased citizen of Heaven) wants permission to have Dante escorted through Hell, Purgatory and Paradise, she does not go directly to God to ask permission. 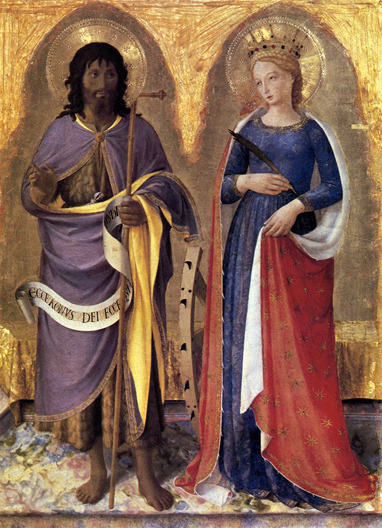 She goes first to Saint Lucy, patroness of eyesight and some aspects of scholarship and one of Dante’s personal preferred patrons. Saint Lucy then presents Beatrice’s petition to the Virgin Mary, and Mary, then, presents it to her Lord/Son who gives final permission. Focusing on the model of God as Emperor, the pope then is his vicar on Earth, which is to say the Emperor is resident in his distant capital but rules a foreign city through a vassal, as the Holy Roman Emperor might be resident in Germany but nominally rule Ferrara from a distance through the Duke of Ferrara, his vassal. Priests, then, are the bureaucratic agents of that vassal, who are trusted by the distant Emperor and can send messages to him and expect answers, and the hierarchy of the clergy is thus the hierarchy of a subsidiary Lord ruling under a distant overlord. This, in 1400, makes perfect sense. The mass of intermediaries seems irrational given our modern individualist model of a world (and therefore universe) of dignified equals (liberty, equality, brotherhood here and in Heaven), and the Protestant model which focuses on a direct relationship between individual and god reduces the value of saints as intermediaries, but in the feudal world feudalism is normal, and the absence of this structure would be rather terrifying. Your average peasant doesn’t want to imagine himself directly in front of the King without the kind protection of his local patron. Now, the Patron Saint bit makes sense when you realize that the nobility generally correspond to places: the Duke of Ferrara, the Marquess of Provence, the lord of this or that. Many nobles rule different scattered territories in different places, as the King of Spain might also be Duke of Athens, for example. But there are also Crown territories that belong directly to the monarch, rather than belonging to a vassal. The king may grant these crown territories to a vassal at any time, as a reward for good service, or a show of his love, and different vassals may also acquire territories through marriage, or conquest, or election, etc. 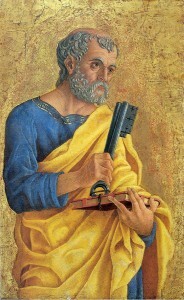 John the Baptist, there on the left, is well-positioned to request favors for his territories, like Florence. Thus, London is a city which, in the heavenly hierarchy, has been granted to Saint Paul. Philip the Apostle received the nation of Uruguay much as Spanish and English nobles received hunks of the New World once they became relevant to European courts. Thomas More was granted the city of Arlington, Virginia once it came into existence, but like any noble who hasn’t yet gotten a particular territory, he was still in the heavenly court before this and enjoyed the favor of the heavenly King, he just didn’t yet have the noble title Patron of Arlington, VA. Sometimes a town goes from having one patron saint to a different one, or gains a second, just as feudal holdings change hands. Meanwhile, before these places acquire patron saints, they are Crown Territories, governed directly by their Lord. Patron saints of particular occupations and types of people also roughly correspond to medieval institutions. A Wool Guild has its earthly patron in the nobles or wealthy leaders who run it, and children do in the nobles or city lords who pay for orphanages; and they have heavenly patrons too, so if Florence’s gild of locksmiths looks to St. Peter and armorers and weapon makers to St. George, that too makes nice feudal sense. This is, of course, one of the clearest ways of seeing how extremely medieval a lot of the accumulation of Catholic doctrine is, and why the modern progress of individualism and democracy has made some of that accumulation awkward in the modern world. Things which were obvious to medieval minds now have to be explained and justified to modern ones not used to the same assumptions about the Heirarchy of Nature etc. Rituals, allegories and similes which were developed by Medieval people to explain doctrine to Medieval people are being adapted and reframed by moderns for moderns. Attempting to explain a patron saint to someone who doesn’t have the medieval concept of “patron” is no simple task. I struggle in my teaching all the time to help students wrap their minds around temporally alien concepts like this, and there’s nothing harder. The fact that contemporary Catholic theologians have succeeded so well in re-framing and reexplaining so many of Medieval Christianity’s concepts in modern terms is, from a teaching standpoint, very impressive. This mismatch is also another indicator of how strange Renaissance Florence was, with its Republican government. Feudalism, monarchy and hierarchy, was the norm, not just in political realities but in the way people thought, their general assumptions. Even the republican Florentines didn’t imagine Heaven as a republic, they imagined it as a feudal monarchy. 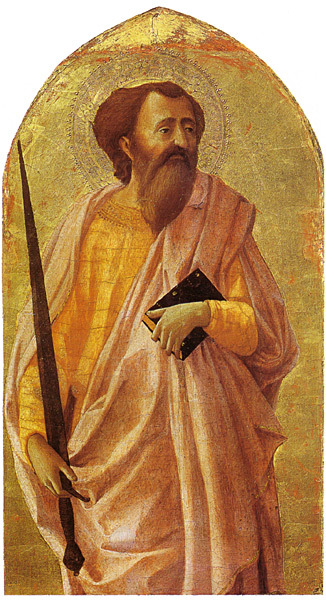 The guilds would rebel violently against any single master on Earth, but were happy to look to their patron saints, and to John the Baptist as the city’s heavenly governor. The inscription over the Palazzo Vecchio makes it clear: republic-loving Florence still happily submitted to the King of Kings and Lord of Lords, but not to anyone else. In the medieval world, then, hierarchy and monarchy were not just the norm but literally worked into the fabric of Heaven and Earth; to have something so different required a truly extraordinary mental leap–though it is certainly debatable whether we should read the leap as forward to modernity, backwards to Athens, or sideways to the unique moment that was Republican Florence.